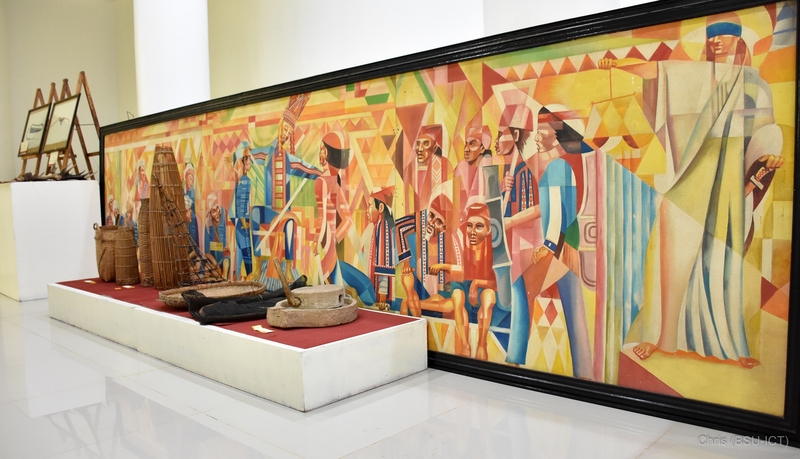 HUSAY, a painting by Vic Barreto is on display at the BukSU Ethno-cultural Museum at the ground floor of the Bukidnon Studies Center Building. The Salagia Clan, through retired judge and Bukidnon datu Benjamin Estrada,donated the painting to the museum. MALAYBALAY CITY (21 June 2018) Bukidnon State University has opened its Bukidnon Studies Center as one expression of its homage to the province’s indigenous peoples. a venue for enhancing cultural heritage, fostering community dialogue and engaging with cultural self-identity. “One of the main tasks of BSC is to provide the community with a powerhouse and a repository of cultural heritage,” Dinlayan added. The center has four sections namely material culture, IP education, Bukidnon studies and IP rights advocacy sections. 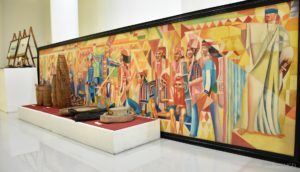 Dinlayan said at the core of the center’s material culture section is the BukSU Ethno-cultural Museum, which was established in the late 1990s. It has become a repository of cultural items, mostly donated or lent to the university. The museum has been a member of the Mindanao Association of Museums (MAM). It was created under the College of Arts and Science and later transferred to the Office of the President. The museum and the BSC as a whole is currently placed under the Office of the Vice President for Research, Extension and International Affairs (OVPREIA). The center also intends to provide support to IP education, which is being implemented by the Department of Education. Inside BukSU, the center was tasked to develop the curriculum for the Bukidnon Cultural Studies, an institutional subject offered by the university. The center will provide orientation and training for faculty who will teach the subject. For the Bukidnon studies section, the center also provides technical services to IP communities who intend to document their cultural practices and other aspects of the community. In BSC’s advocacy to promote IP rights, the center seeks to consult with communities in developing promotional materials about their culture, provide support in documents needed for application of ancestral domain titles and the over-all promotion of local culture and tourism. Dinlayan said primarily, the source of inspiration for the creation of the center is the fact that Bukidnon is home to IP communities and is host to thousands of IP students. Among academic institutions, Dinlayan said they were also inspired by the University of Southeastern Philippines’ Pamulaan Heritage Center in Mintal, Davao City, because of their partnership with IP communities. Dinlayan said BSC’s establishment is a humble act of the university to recognize and respect the indigenous cultural communities (ICCs) of Bukidnon whose culture are worthy to be preserved, protected and promoted. This action, she added, is aligned with the mandate of the 1987 Philippine Constitution and of the IP Rights Act (IPRA) of 1997. The BSC has evolved from being the university ethno-cultural museum to the proposed establishment of an IP Education Center. The BukSU Board of Regents finally approved the creation of BSC in 2017. Bae Inatlawan Adelina Tarino of the Bukidnon Daraghuyan, served as the main ritualist on November 17, 2017 when the university submitted the center for the traditional ritual. She was joined by datus and baes from most of the seven tribes of Bukidnon during the center’s soft opening. Dinlayan said the formulated content and objectives of the center were also submitted for consultation to the IP Mandatory Representatives of the province during their assembly. The BSC bears a logo that reflects the inter-relationship of people, environment and culture; and the cultural uniqueness of the university emanates from these three elements. BSC is now housed in a three-storey building open for the stakeholders to avail of its services. BukSU celebrated its 94th founding anniversary and 11th year as a university on June 18 (With a report from Ms. Loreta Sol L. Dinlayan/BukSU Information and Publication Service).